BORA III RACE is faster, easily manoeuvrable and has better performance in traction in comparison with the older model Bora II. How were these innovations achieved? Maximum bend of the middle profile curve was displaced backwards by 4 %, which has caused higher flight speed and higher traction power within the whole range of speed. Steep climb (ride) upwind is also easier now. Excellent flight characteristics during descent (ride) downwind were maintained. 2. Change in geometric twist of the wing. The improvements in the construction of A, B, C lines enable the maximally flexible setting of the profile according to the air flow, optimal in every situation. These changes have significantly improved both the responsiveness and the stability of the kite in strong turbulence. Even the start and landing of the kite are much easier and safer. New type of brake line row enables a perfect regulation of speed and performance in every situation. In the first stage of braking the flight speed is maintained and the traction power (uplift) is continuously increasing. In the second stage the maximum traction power (uplift) is maintained and the speed is continuously decreasing. In the third stage both the power and speed are decreasing simultaneously until the kite completely stops. For illustration we can say that the brakes work similarly to those of airplanes: First stage – wing flaps. Second stage – brake flaps. Third stage – brake shields. New setup balance enables perfect setup of the required performance and speed. The kite is supplied with the balance set up in universal position (the rows of lines A-C on the same level). However, every rider can set up the balance according to his/her current requirements and weight. When A-lines (red front line) are extended, the performance, power and stability in turbulence increase. Recommended for riders with weight over 80 kg or in extremely turbulent atmosphere. On the other hand, when A-lines are shortened, the speed increases and the maximum performance is reached within a higher speed range. Recommended for hard smooth surfaces, for extremely high-speed snowkiting or for riders with weight lower then 60 kg. New possibility of adding the fifth line to BORA III RACE kites of 2,6 – 7,1 sizes. This Bora speedsystem and depowersystem enables continuous regulation of power and speed. It is not possible to supplement the older model BORA II with this system. Everything is manufactured to ensure high performance and durability. Maximum attention is paid to production quality and carefully worked-out details. High-quality, time-tested material “TORAY-Chikara” is used for both upper and lower covering of the wing. This cloth is finished with a unique technology – it is impregnated with special paste simultaneously from the right and reverse sides in protective atmosphere (TORAY patent). This know-how ensures almost zero air permeability and extremely long durability of Chikara cloth! For stitching Chikara, UL Profil has special threads made to order, which ensures optimal elasticity and durability of all stitches. The lines on Bora balance in rows A,B,C,D are made of highly resistant EDELRID-Aramid,Dyneema. The lines are finished with stitching and in some points with knotting. 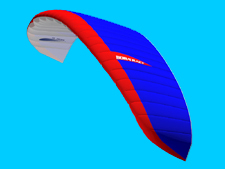 Knotting has proved to be more suitable for Bora kites as far as aerodynamics are concerned. The company EDELRID supplies us with Ø 0.9 mm lines used specially for Bora kites. The complete setup and flight tests were carried out by UL Profil pilots, the same team as in the tests of Bora a Bora II. Due to its excellent flying characteristics and extreme power, BORA III RACE is meant not only for racers, but also as a universal kite for all advanced riders. BORA III RACE - construction data. A BORA III RACE kite is composed of 378 parts. The well-tuned construction and the usage of highest quality materials enable the firm UL PROFIL to extend warranty for BORA III RACE kites to 36 months from the date of sale.